Most pet owners are used to being vigilant for parasites when it comes to cats and dogs, but don't forget your duck. Whether you have a backyard barnyard or a duck or two roaming your property, your feathered friend also is vulnerable to parasites. If your duck has mites, chances are it's the northern fowl mite or the chicken mite. Cleanliness, diligence and a sharp eye will minimize your duck's risk of hosting mites. There are thousands of species of mites in the world, so consider it lucky that your duck is vulnerable to just a few types of mites. Poultry, including chickens, turkeys and ducks, are susceptible to four types of mites: the northern fowl mite, depluming mite, scaly leg mite and the chicken mite, also known as the red roost mite. If your duck has mites, it's likely the the northern fowl mite or the chicken mite, the two common mites that feed off ducks. Both mites are bloodsuckers, but vary in how much time they spend on the duck. The northern fowl mite spends all his time on the bird, living on the duck for up to three weeks, though a life cycle as short as seven days is common for him. The chicken mite is nocturnal, drinking from the duck during the night hours and hiding in the wood of the chicken coop or beneath clods of dirt during the day. This mite also tends to have a life cycle of about a week. Despite their tiny size, mites can have a big impact. A duck infested with mites will often lay fewer eggs, lose weight and eat less; she may scratch more and her eyes may look dull. The blood loss from the feeding mites can cause lethargy and you may see blackened feathers from dried blood or mite feces. Check your duck’s ventral region and along the feather shafts for mites or eggs if you notice symptoms. It’s best to inspect your bird at night, when you'll see the nocturnal mites at work, though you may see the mites during the daylight hours on the duck’s housing structures. If your bird is the rare duck that hosts the scaly leg mite, you’ll notice the scales on her feet and legs separating from her skin. She also may have swollen legs and feet, with a discharge under the scales. Cleanliness is important when it comes to dealing with duck mites. If you have a flock of poultry, their housing should be thoroughly cleaned and disinfected. Since mites are transmitted easily from wild birds, minimizing the amount of contact your duck has with potential vectors will reduce her risk of picking up the parasites. Your vet may suggest Carbaryl as an effective chemical for treating both your duck and her roost. Be sure you don’t get the chemical in her eyes -- and neither of you should inhale it. Because of the nature of the mite life cycle, your vet likely will recommend treatment should occur every two weeks until the mites are eliminated. 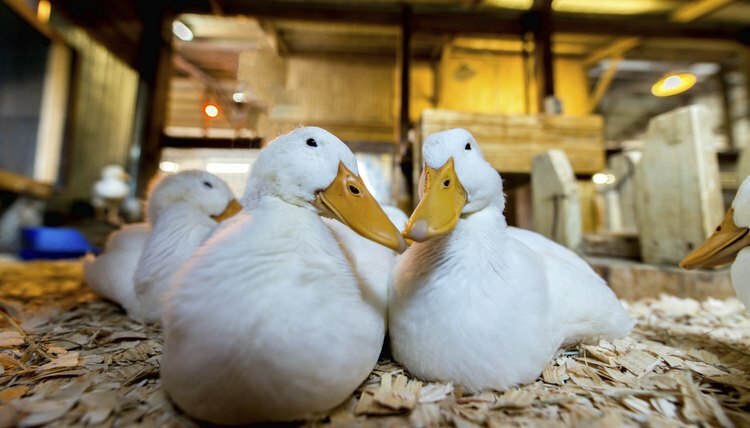 A clean coop and regular inspections will help keep these parasites away from your duck.